A family breakdown can be a confusing, sad and distressing time for everyone involved. Many children (and parents too) mourn the loss of the family they had hoped for and parents can feel unsure and anxious about how to support their children through the separation or divorce process. However, many children are able to recover from the stress, insecurity and change of a separated family and thrive just as well as other children do However the way that they cope depends largely on the way their parents handle the situation themselves, how sensitive they are to their children’s needs and what they do to actively help their children cope. Patience, reassurance, empathy and emotional intelligence are extremely important in helping children to understand and cope with their new circumstances and although it can be very hard, parents can be powerful and positive influencers in spite of an often difficult situation. Acknowledge their feelings. Children have to know that their feelings are important and that parents acknowledge and legitimise their feelings and take them seriously. Sometimes, children’ behaviour will offer clues as to how they are feeling (eg they may become ‘clingy’, rebellious, angry, aggressive, silent) and it’s important to encourage them to verbalise their emotions without being judged. Maintain a civil relationship with your ex-partner in front of the children. As hard as it may be, it’s important to avoid conflict in front of the children, keep the details private and not to involve them in your arguments. Apportioning blame, trading insults and getting children to ‘take sides’ is counter-productive in establishing their emotional wellbeing. Reassure children that they are not to blame. 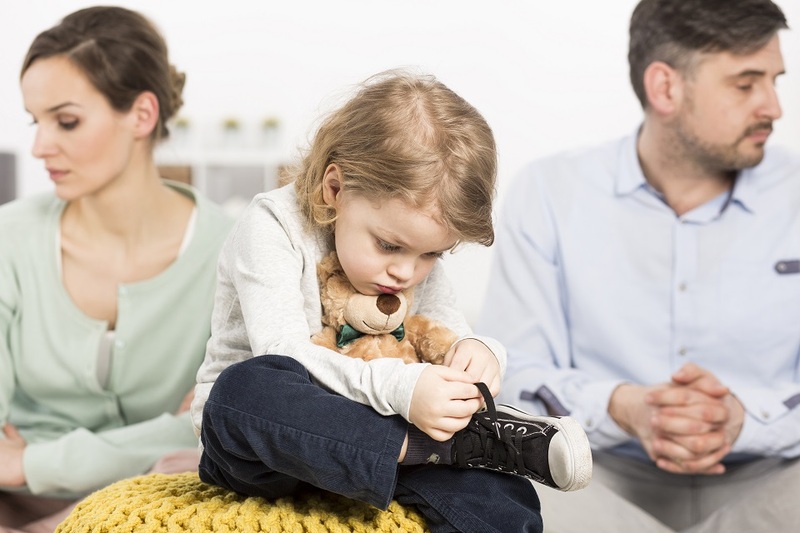 Children need constant reminders that their parents’ decision to separate or divorce was made by the adults, independently of the children and that they, or their behaviour, are not responsible for that choice. Reassure them that you understand that the process is upsetting and unsettling, but that you are handling it. Actively encourage them to have an ongoing relationship with both parties. Even though you may be feeling angry, guilty, jealous, sad or anything else and as hard as it may be to put those emotions aside, it’s important to encourage children to have a good relationship with both parents. Look after yourself. It’s important to find ways of dealing with your own emotional and physical wellbeing and to take care of your own needs so that you’re in the best possible shape to help your children. Reassure your children that you both still love them. They need to feel loved, confident and strong, so keep telling them that both parents will always love them. Keep communicating. Keep talking to your children and encourage them to talk to you. Remember, it’s helpful to offer them support (e.g. ‘what would you like to do to help you feel better’ etc) but sometimes, you don’t need to ‘fix’ something, you just need to listen. Even though it may be difficult to hear what your children tell you, it’s helpful to be positive about the other parent when talking to your children. Get help. You shouldn’t lean on your children for support, but should rather seek help and emotional support from other adults. A professional counsellor or therapist can be a valuable resource in terms of your own emotional health, providing guidance and tools to help yourself and help your children through the divorce process. Getting good legal advice early on is another important way that parents can help their children. An experienced and approachable firm of divorce lawyers like ours understands that your children are your primary focus. We will provide practical, timely advice about reaching an agreement to facilitate a meaningful relationship with both parents and how to protect them from physical or psychological harm. Paterson & Dowding are leading divorce lawyers in Perth and have teams of highly qualified, professional, experienced and dependable practitioners and mediators in both their Perth CBD and Joondalup offices. Contact them on 08 9226 3300 or visit www.patersondowding.com.au to find out more about their family law services in Perth.